What is In the Food Guide Wheel? Comparing the proportions of the different spokes of the wheel, you will see immediately the relative importance of the various foods that make up a healthy diet for an average adult or child. For an adult, these Food Guide Wheel proportions are based on a 2,400-calorie diet. The grain group, a prime source of energy, supplies about one-quarter of the daily calories for most children and adults (more or less, depending on energy expenditure). One serving = one slice of bread, 3/4 cup of dry cereal, 1/2 cup cooked cereal, 1/2 cup rice or pasta. Together these groups comprise another quarter of a total daily healthy diet. 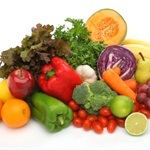 Vegetables: one serving = one cup of raw or 1/2 cup of cooked vegetables, 3/4 cup of vegetable juice. Fruits: one serving = 3/4 cup of fruit juice, one medium apple, orange, or banana; 1/2 cup of fruit. Flax, canola, and soy, plus nut oils. 1 serving = 1 tbsp. Keep sweet treats a minor part of your diet and gradually make them less sweet and less fatty. One serving = 200 calorie equivalent of pie, cake, cookies, or ice cream.